The first of our monthly handicaps for the 6-month series was held on November 16 at Mariposa Basin Park. Some of our January handicaps have been legendary in terms of bad weather but never have we had that happen in November. The morning of the 16th dawned with snow and ice in the mountains and a driving, bitterly cold wind on the west side. But that did not stop our runners from showing up for this beautiful, ~5 mile run. Runners huddled together and waited in their cars until the last possible minute before their start times to try to stay warm. 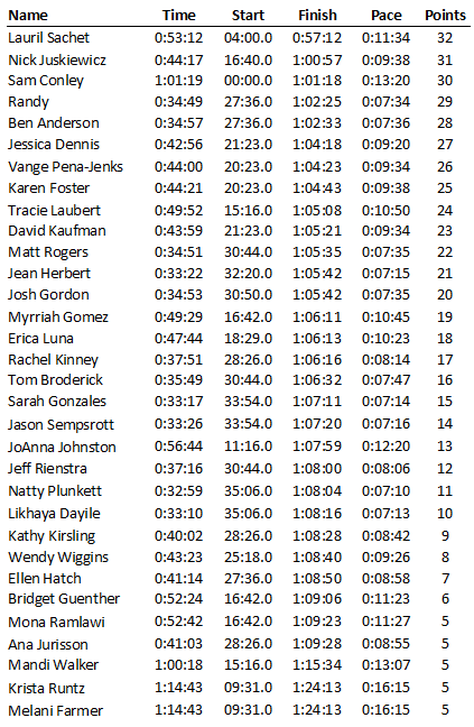 I’m not even sure anybody warmed up running, even with the 14% grade hill in the middle of the course. The timing crew resorted to hunkering down on the side of a small hill below the bike path to shield them from the wind. It probably looked like homeless people on a cliff to passersby on the road but it was effective at blocking the wind! A big thank you to all of the volunteers that helped that morning – Gwen and Danny Walker who hosted and helped out on the course, Danny’s father who stood in the wind tunnel at the top of the hill, and Fred Bonnell who helped with timing. Congratulations to the handicap winner, Lauril Sachet, and fastest runner, Natty Plunkett. Both of these ladies were attending their first handicaps so we hope to see them again at future ones. For their efforts, they received some great prizes donated by our local running shops. Lauril received a “Run NM” t-shirt from ABQ Running Shop and Natty’s prize was a bag of Sport Beans donated by Athlete’s Edge. Please keep these and our other local running stores in mind when buying your running gear!